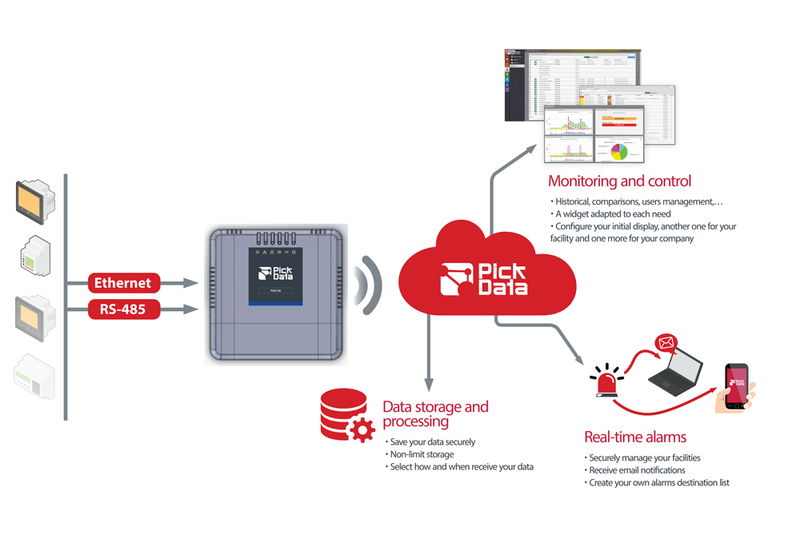 PickData solution carries your devices to the world of the Internet of Things and, to achieve it, is based on three major pillars: PICK VPN/3G gateway, integrated GPRS/3G communications and EVO IoT web platform. EVO is a powerful web platform ready to receive real-time information of devices distributed around the planet and store, manage, monitor or export this information, receive alarms and take actions, work simultaneously with high volumes of devices and data, complete analysis, graph data with multiple widgets and generate specific reports for each application. EVO is constantly updated to the latest technologies and it can be customized for each client to bring it a complete branded look&feel. If we take a look at hardware, PICK VPN/3G gateway is a device specifically designed to communicate sensors, machines, devices or installations with the EVO web platform using mobile network (GPRS/3G). For special applications where our gateways don’t fit your requirements, gateways can be developed with special features. To link software and hardware, the solution integrates free VPN global communications through mobile networks (GPRS/3G) to send data from all the gateways to the web platform from most countries worldwide, reducing very significantly the costs of installation and operation. These services can be managed, monitored, activated and deactivated with one click on the web platform at any time and for any device. Our solution is based in GPRS/3G communications to upload data registered from gateways to EVO IoT web platform. If 3G network is available, PICK VPN/3G always choose this way to transfer data and alarms, even though it will transmit using GPRS if there's no 3G coverage along the gateway area. The model PICK VPN is provided with a SIM card to bring to the gateway a full-duplex VPN communication between the devices and the IoT Platform. The cost of the communications is included in the gateway price.